This year our school has the great fortune to be expanding from 32 iPads to 160. Within our AUSL school network there are an additional two other schools that are a part of the CPS iPad expansion wave. As a result, my role this year is changing from sole iPad practitioner to iPad facilitator, coordinator and coach. While I will still be able to experiment, explore, refine and reflect on technology integration with one period of 4th/5th math a day, I will now have some "release time" to support teachers new to this terrain. A total of 9 teachers at my school will be utilizing iPads to evolve their classroom landscape, with additional teachers at two of our sister schools. We all exist within a larger Chicago Public School PLC of several dozen schools. So the question became - how to manage our learning community? As with most schools, considering all of the teams, committees and PD meetings, it is quite difficult to find time and space to come together. So I thought to myself, why not use technology for a TechEd PLC? Therefore we created a Google Site to manage announcements, schedules, attachments, app request Google forms, etc and embedded a blogger site to manage our PLC conversations. After just a week, I can already feel that this was a good choice. 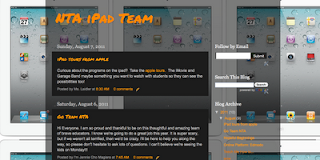 The members of our PLC are not only contributing to this blog, but they are being open and honest with their excitement and fears, commenting and sharing with others, and engaging in the reflective process -- all before a single device has entered their classrooms. As we continue in this process, we hope not only use this space to air concerns, victories and questions, but also to post videos of our instruction, photographs of students engaging with the technology, examples of student work and teacher resources. Our Site and Blog will not only be a forum for discussion and sharing, but will eventually also stand as evidence of our learning, growth and successes. Good luck you guys! Can't wait to see the outcome of the group. Sounds like an incredible endeavor. Looking forward to reading about how the collaboration goes. May I ask what two other schools are in on this? Are they math classes at the other schools? Joe - The other schools are Tarkington and Bradwell. At least one other class is math! Guest Blogger on LaunchPad Toys!